First TV Writing Job — Check! Wow, it’s been a minute. I knew it had been a while since I had time to blog. Turns out I was last here on May 16th, when I decided to give notice at my job and have faith that the writing gig I’d long sought was waiting around the corner. I was excited to be sure, but also grounded. I’d gotten close three other times to getting a job. And so even though I really wanted this and knew I was ready for it, I went into preparation mode knowing my life wouldn’t end if I didn’t get the gig. Then there was watching the pilot… three times… and reading the latest version of the pilot script and thinking up ways that my life experience made me a good fit for this show. The next day, after I made sure my room was clean enough for Skype and after I picked out my favorite business casual t-shirt, I met Ken Sanzel over the computer. It was a good conversation, though I couldn’t honestly tell you now what most of it consisted of. It felt like we got along really well. It ended with my asking when he might make a decision and Ken saying probably in the next day or two. And that was that. I had a lunch date with another writer friend, so I left messages for my agent and manager, sent up a little ask to my Dad that he pull any strings he had up on high in heaven, and went off to lunch, which was great and fun, and I never bothered to pick up my phone because I wasn’t expecting anything but a possible recap phone call with my reps. Okay, I can take hard questions, I thought. Lay it on me. I cried. I’m not gonna lie. I cried right there in the thankfully very empty restaurant with one customer and one waitress looking at me wondering what was going on. I cried for all the times I almost gave up and held on; for all the nights I slept two hours to meet a deadline for my writing programs at CBS and NBC; I cried because I am lucky enough and blessed enough to have been surrounded by people who believed in me. I cried because finally… finally… someone said yes. There were a lot of phone calls then, and celebrating… at least after the waiting. Waiting for your deal to be officially signed so you can shout your good news to the world feels like torture till you remind yourself how long it took to feel that exquisite, awful delay before you can tell people your dream finally came true. The best call came from my mom the day after I told her I got hired. She called to make sure I had really given her the good news and she hadn’t dreamed it. She had dreamed it so many times, she just wanted to make sure it had actually happened. There was also the amazing news and gift that one of my great friends, Brian, was also staffed on the show, and we would be there to help each other through those staff writer ups and downs. Seriously… that was a miracle of some writer god’s making, and I will never forget how the universe had my back there. We started our show the first Monday in June, and we hit the ground running. First thing you should know, Ken’s not a room guy, so we ran a “writers’ hallway.” Our crew of consulting producers, co-eps, producer, and Brian and I got used to moving into each others’ spaces quickly and comfortably, bouncing story areas, breaking out our boards, and asking questions. Lots of questions. I was the only person on our staff who had never been on a show before. But everyone, from our P.A. to the boss was willing to answer a question, point me in the right direction, or just let me blather my way to the answer on my own. (This includes my man Brandon, who didn’t tell me I could park at base camp during my location shoot, but I love him anyway). There were hard days in the mix of awesome. It took a while to get my area in shape, and then I think I wrote no less than six drafts of my outline. The first draft of my script was… not what it needed to be. The second made me feel like I had earned my desk. Then there were notes and then there was prep, and thankfully I had an awesome co-ep shepherding me along the way. You should all be listening to The Mick Betancourt Show on iTunes, btw. He has great people sharing their stories about how they got started in the business, along with some amazing life history that will show you, truly, we all get there in our own way. After prep came shooting. And let me tell you, if I thought I was blessed before, the crew that made our show happen was the extra helping of wonderful. They were so patient with the new kid who didn’t always know where to stand and who dropped her phone under our vehicle barricade and tried to act all nonchalant about looking for it. They taught me a lot, kept it loose, and got the job done with incredible dedication and class. And then on the last day of my shoot, we got the news. 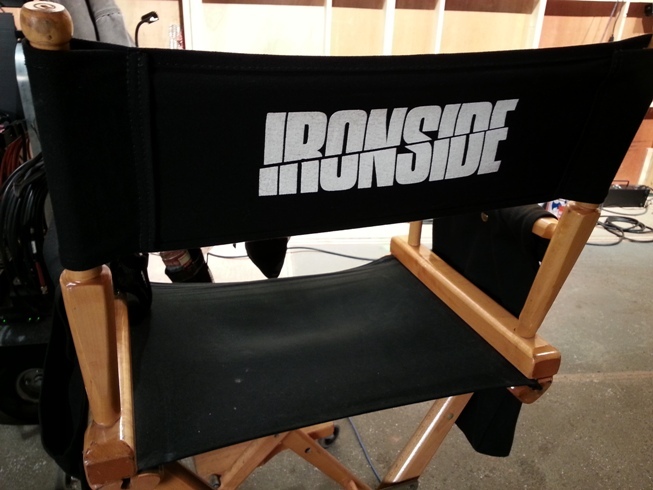 “Ironside” had been canceled. On top of that, the final day of shooting on my episode was it… we were “done” done. It broke my heart to be sure… I was working at this amazing job, making TV, surrounded by some of the most generous, talented people I’d ever met, and now we had to say good-bye. Our final night of shooting rolled past midnight and into my birthday. The crew gave me a cake and sang, and I told them I couldn’t think of anywhere better to be celebrating, and it was the absolute truth. My first job as a writer lasted just shy of five months, but I got some serious bang out of it. I got to write an episode, see it produced, and even though we’ve officially ended, I’m still getting the chance to sit in on post and watch the final product come together. It’s been amazing, and I don’t think there are words enough to tell you all how incredibly full-up with goodness I am after this experience. It took a village for me to get there. So thank you to all the friends and family who kept me going; thanks to Brant, Toochis, and Steven; thanks to Carole, Jeanne, Janie, Karen, Jen, Julie Ann, Stacey, Stacey (yep, there’s two! ), Bruce, and Deepak. My village is pretty damn awesome! Thank you to Blair, Brent, Pablo, Neal, Spencer, and Kenny for being such a great cast… And thank you to all the fantastic guest actors who kept me mesmerized during my shoot, especially Lou Diamond Phillips and Robert Forster. And thank you, thank you, thank you to Ken, Mark, David, Rob, Judi, Mick, Talicia, and Brian for being the best first “writers’ hallway” cohorts a girl could ever ask for. Somehow, someday my episode will be something people can see. When I know how, I’ll let you know. And now… on to show number two, wherever you are.